The militaries of South Korea and the U.S. are known to have named the upgraded version of North Korea's KN-08 road-mobile intercontinental ballistic missile the "KN-14." 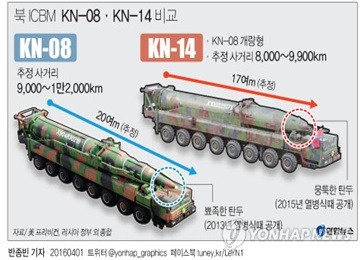 Responding to a question during a regular briefing Friday, Seoul's Defense Ministry spokesman Moon Sang-gyun said that South Korean and U.S. authorities are believed to have tentatively named the KN-08's upgraded version KN-14. During a military parade marking the North's ruling Worker's Party's 70th founding anniversary last October, the North unveiled a KN-08, which features a more rounded warhead. A U.S. defense news outlet, the Washington Free Beacon, reported Thursday that North Korea developed an upgraded version of the KN-08. 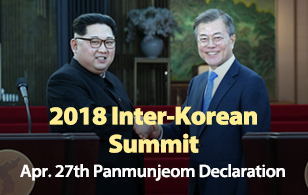 South Korea and the U.S. customarily issue names for new missiles comprising of the letters KN, the initials of North Korea backwards followed by a number.